Hello! 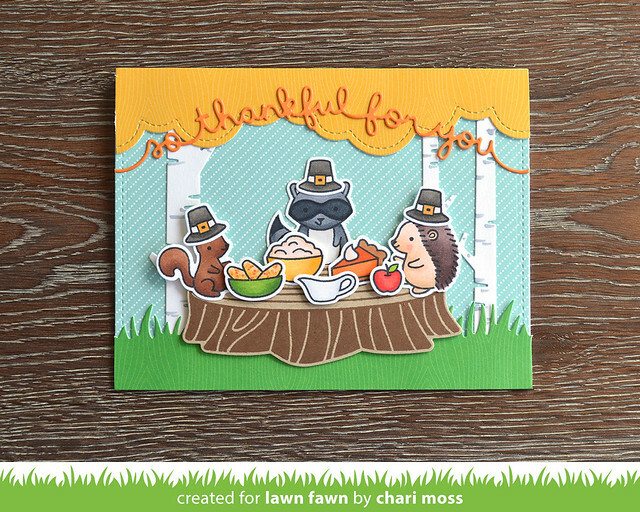 Today I have a cute little Thanksgiving card to share for Lawn Fawn Inspiration Week featuring Forest Feast and the new Birch Trees dies. I colored all my critters and their feast with copic markers. The large table stump is stamped with walnut ink on kraft cardstock. For the birch tree trunks I die cut them from white and added some grey accents with a grey copic marker. I used papers from the Knock On Wood paper pad for the grass and tree canopy cutting the grass with the grassy border die and the tree tops with the middle sized puffy cloud border die. I used the new So Thankful For You border die for the sentiment, cut from fake tan card stock. Be sure to check out more Forest Feast projects on the Lawn Fawn Blog. Thanks so much for stopping by today! Oh so cute!! I love that you used the cloud dies as the tree canopy. Clever ! I would never have thought of this. This is so cleaver using the cloud die for tree leaves! adorable card! Such an adorable design! Love that you added pilgrim hats to the little critters. The birch trees really are a great addition, too!